Retailers face more challenges and competition today than ever before. To compete, they find themselves forced to do more with less, and their point of sale (POS) is a vital part of their strategy. No one understands the trials faced by today’s retailers than Armagh POS Solutions, who has been providing Retail Point of Sale systems in Ontario since 1979. We provide solutions to a wide range of retail environments and understand nearly every vertical – from hardware stores, to convenience, pharmacy, clothing and apparel, sporting goods, tobacco, beer, liquor and wine, and specialty retailers of every type. 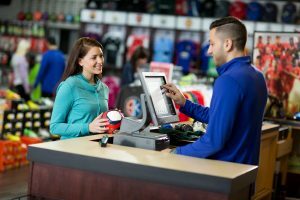 In the world of retail, point of sale is more than just a cash register. It is the unified hub for all technology in the store, and the architecture for which everything revolves. Today’s retailers are smart, and they understand what’s possible. At the front of the store, retailers want integrated gift cards and gift receipts, and they want it to work seamlessly with their integrated credit & debit with tap & pay. They want to offer their customers loyalty programs, emailed receipts, customer engagement, social media campaigns and other marketing programs, emailed coupons, and they want an app for their customer’s phone – and they want it to report back to the POS system. They want mobile handheld options, shelf tags, online ordering, and they’re curious about self-checkout. And that’s just what the customer sees on the front end. In the office the smart retailer wants interfaced accounting, and superior analytical reporting. They want inventory with automatic reordering, better yet, they’d like to have their purchase orders automatically sent electronically to their suppliers, and their suppliers to automatically respond. Multi-store retailers want to be able to manage their whole enterprise from one location, with detailed analytics and reports. All of it is possible in your retail store and we can help you do it. Armagh POS Solutions has the services available that can make this dream a reality. Not only do we provide the point-of-sale products and features todays retailers demand, but we also support it with local 24/7 onsite support and service and expert consultation. If you’re looking to streamline your retail operations, reduce costs, improve customer service, and maximize your profitability, Armagh can help you get there.